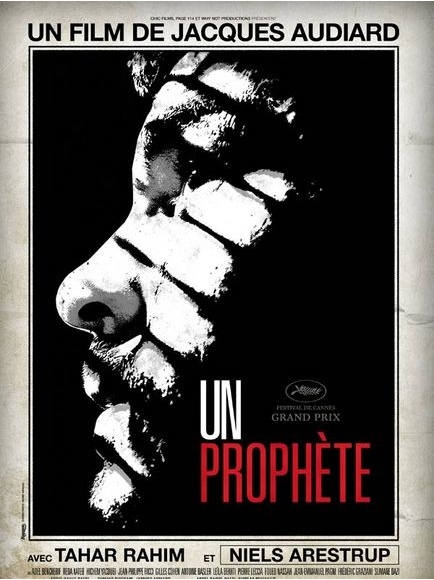 I went to see Un prophète today, which is, as you can see below, un film de Jacques Audiard. Though obviously I saw the subtitled version. It’s a gangster/prison drama about a young French Arab, played by Tahar Rahim, who arrives in prison at the start of the film and is immediately approached by a Corsican gang who threaten him and offer him protection in return for killing someone. The film starts with Malik arriving in prison — we learn almost nothing of his life beforehand — and ends when he leaves, so it’s set in a very grey, constrained, claustrophobic world, and visually it’s mainly a kind of gritty realism. It’s rather Wire-esque, both in that visual style and in the attention to the procedural and mechanical details of prison life. I thought it was a very good film. It works as a gangster movie — perhaps slightly slower-paced than you might expect from most American movies in the same genre, but none the worse for that. But it’s a gangster movie with an underlying serious-mindedness and darkness, and with other themes running through it, most obviously the French muslim immigrant experience, that give it a bit of heft. And it has a very good, understated central performance by Tahar Rahim. I was reading your previous blog comment on the WordPress theme design you took part in several years back, and really liked the way you analysed them. I was hoping to invite you to take part in the 2010 Voxbiblia WordPress Theme Design Competition, in which Voxbiblia is sponsoring more than $2000 worth of prizes! It would, of course, also be fantastic if you’d be willing to mention this competition on your site, but that’s a different matter altogether :) More details can be seen at http://blog.voxbiblia.com, and we’ve also set up a Facebook events page (http://www.facebook.com/event.php?eid=296834441810&index=1) should you wish to invite your friends to the competition as well! Voxbiblia is an audio Bible company that strives to use the wonders of digital technology to bring down the boundaries limiting Christianity. As a result, we have been trying hard to come up with ways to generate more blog skins for Christian uses. We have since come up with a competition (just launched last Friday) in which we hope will encourage people (Christians and non-christians alike) to create Christian themed designs, which will later be distributed for free. Would you be interested in participating? Do let me know! I hope to hear from you soon! Good luck with the competition, though.